Thread: From W. Germany by way of Colorado. A new old saw, born in 1985 and practically untouched. Unearthed from a basement in Colorado, shipped to NJ and put back into a basement. Here is the timid beast, we must approach carefully. Long day, I tore it down to nuts and bolts, with the help of my dad, and lugged it down the stairs to reassemble. Was a piece of cake mainly. The table had some weight to it and the moving parts as well but overall not bad. 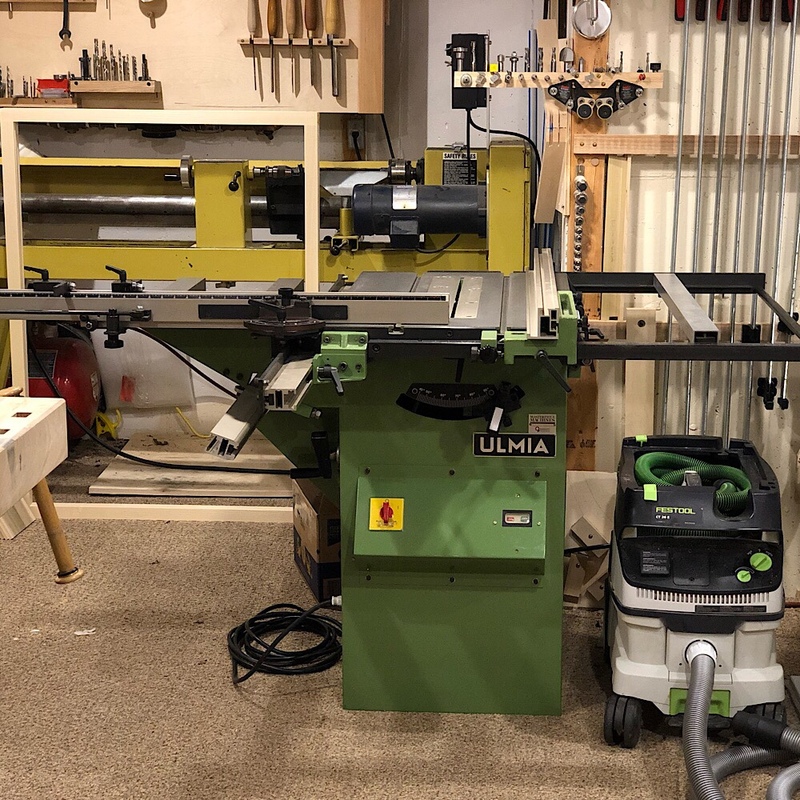 Cool thing about this saw is that a double miter can be attached to the table top, bolted tight and the entire table top will move if so desired. It moves on a large linear rail. I spent a few minutes tuning up the slider, was pretty straightforward. Last edited by Brian Holcombe; 03-23-2019 at 12:19 AM. Lucky you! Those are very good saws. That saw looks vaguely familiar. Does it have a slot mortiser function built into it? Wow Brian your really on a machine purchasing tear. How come we have yet to see the Maka make some cuts. Has the project stalled for some reason. You gotta get some rubber flooring I’d go mad vacuuming up the dust 300 times a day. I got mine cheap froma place that sells high end gym equipment. They sold me there offcuts from projects for a huge discount and it’s way nicer than any of the options from just about anywhere. Thanks gents! Very much looking forward to making some sawdust. Thanks Patrick, actually Chris Hall found it for me. Edwin, this one doesn’t have the mortiser, instead it has a double miter/rolling table setup. Looking through the manual it appears there were a lot of options for these machines. Some interesting things; They were outfitted with Baldor motors and 5/8” arbors. I found it interesting to not find a metric motor but that makes repair work easier. Thanks Patrick, I had a feeling you would like the color and gloss! I like it, your thread has won me over on the green paint. Totally agree on the rubber mats, I need them now mainly so I can move the machines around. This will probably end my machine buying binge (for now) since I’m near completely out of space. The maka is almost complete, I was absolutely swamped with work last month. Every waking moment was work, so I will get back to the maka soon and wrap it up. Very kewel...I can't wait to "fondle" that on my next visit!! Haha! Thanks, Jim! Should be up and running soon so you’ll be able to test it out. Brian, that's a sweet looking machine. 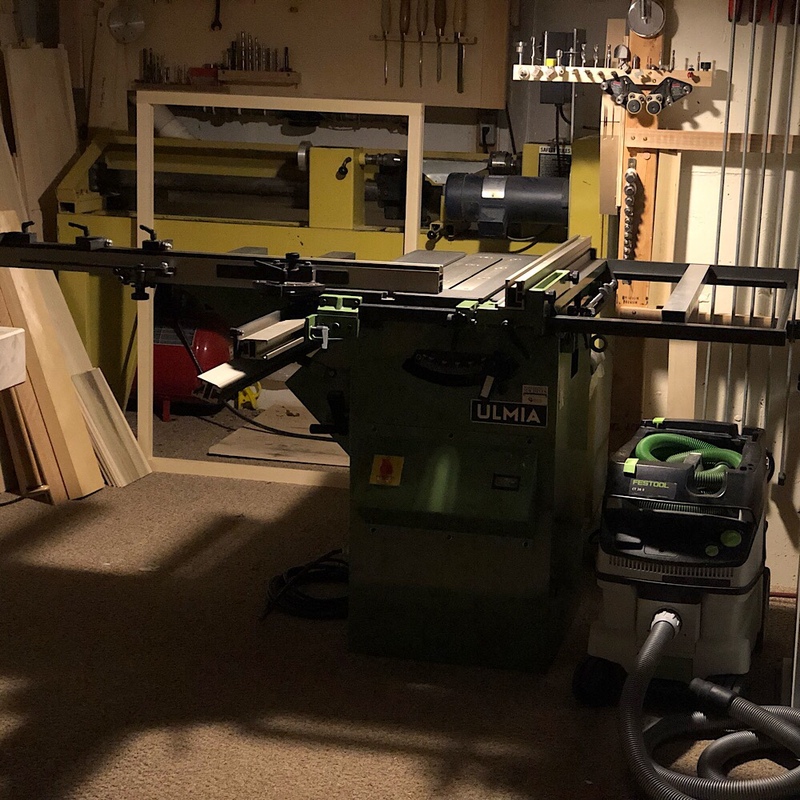 The main cabinet, how does it compare to a typical cabinet saw. Nice saw Brian. Always liked Ulmia, they made some nice stuff. Wow, that thing looks brand new. Pretty nice not to have to mess with restoration work. Excellent find! What's the sliding stroke on that machine? Brian, so that's why the blade insert has such a long slot? Required so the top can slide? I'd really like to see how that works. The range of motion looks limited if that's how it works, but it ought to be great for high precision work on relatively narrow stock. Sure is a nice looking saw. Typical German precision. With all of the adjustments on that tablesaw it looks like the Ulmia leaves no room for error! Thank you! I’m not sure, I have very little time on cabinet saws so I don’t have much basis for comparison. Thanks, Dave! 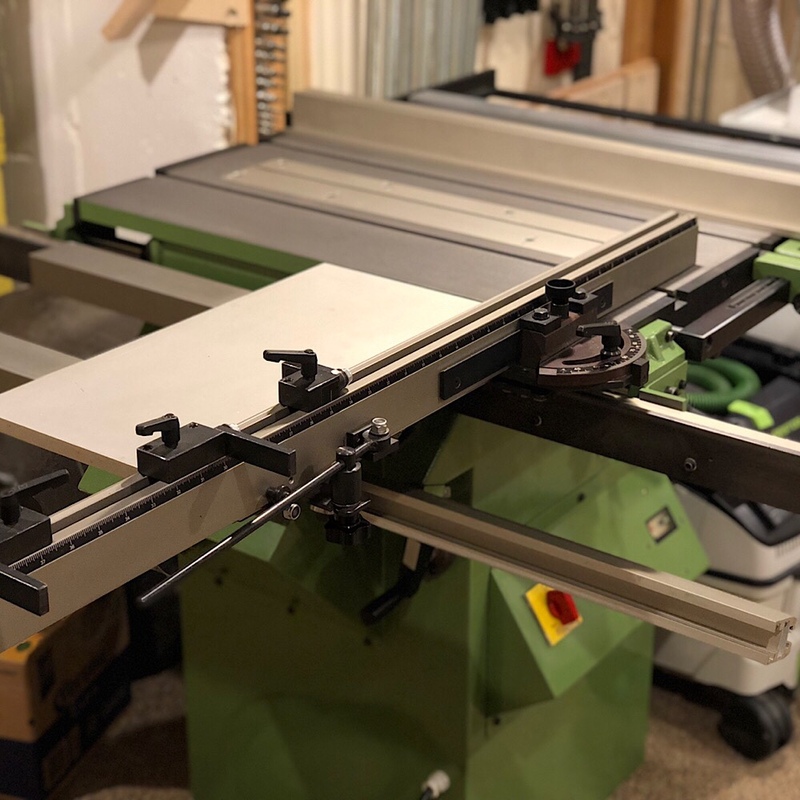 I’ve been sort of itching for another resto but it’s going to probably be an early German sliding table shaper at this point (after I manage to get space for it). Totally! As much as I enjoy resto/mod it is nice to plug it in and cut things. Hah! The carpet does need to go. I’m curious as well, once I have some experience with it I’ll post up a video. The machine claims 10” of travel. On the table. The slider attachment offers about 24” of crosscut. I was originally wondering why they’d bother but I see the utility of it, you can set up two legs of a frame with stops and have everything cut in one batch. Nice especially for stuff outside of 45 degrees and any error is countered by the double setup. Not sure I’ll do much with that feature, but one day it may come in handy. Absolutely, the entire thing is adjustable in fine increments.